Boil the pasta in plenty of water and one teaspoon of salt. Heat the oil in a large non-stick saucepan. Add the chopped garlic, onions, and the jalapeno pepper, lower the heat and stir fry for 2 minutes. 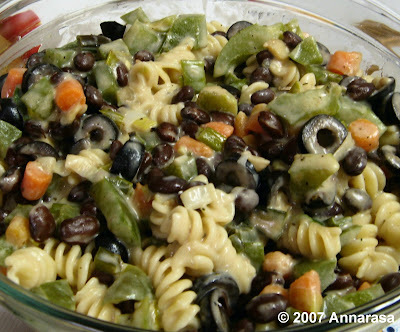 To this, add the black beans, olives, carrots, and green pepper. Stir once, then cover and cook for 5 minutes. In a separate bowl, mix the milk, stock, and the cornflour. Pour into the vegetable and bean mix, stirring constantly. Once the sauce begins to thicken, add the cheeses, and the salt and pepper to taste. Mix well and stir on low heat for around five minutes. Taste the sauce, adjust the seasonings, and pour over the pasta. Serve hot and enjoy the explosion of flavours. This recipe goes out to Katie who is hosting Presto Pasta Nights #73. Thanks Ruth Once Upon a Feastfor keeping this super event going!! Beans, olives and pasta - perfect. Oh, and the cheese and peppers is nice too. This looks tasty, and perfect for hot weather! Lovely pasta. I want to try it. Pls let me know whether jack chesse has less fat when compared to other cheese.